He invoked the gods, crossed gender barriers, and made political points at every turn. 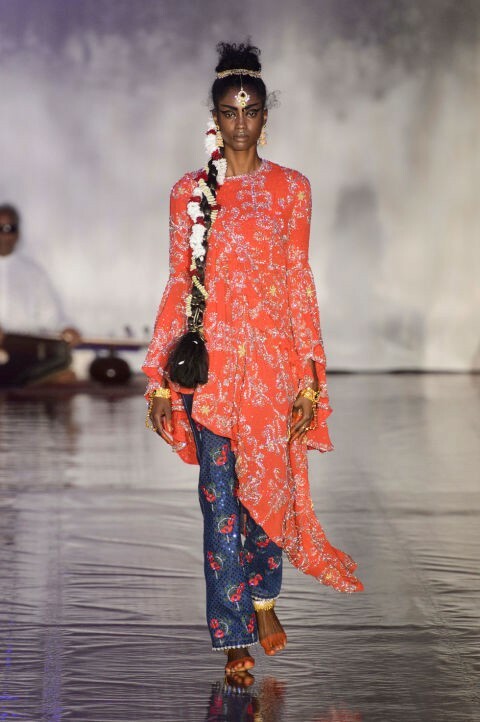 Yesterday, a solemn sitarist in a white kurta sat at the end of designer Ashish Gupta’s runway and as he tuned his instrument, audiences knew this would be no ordinary fashion show. The sitarist wore sunglasses — not to shield him from the house lights. He was, in fact, blind. 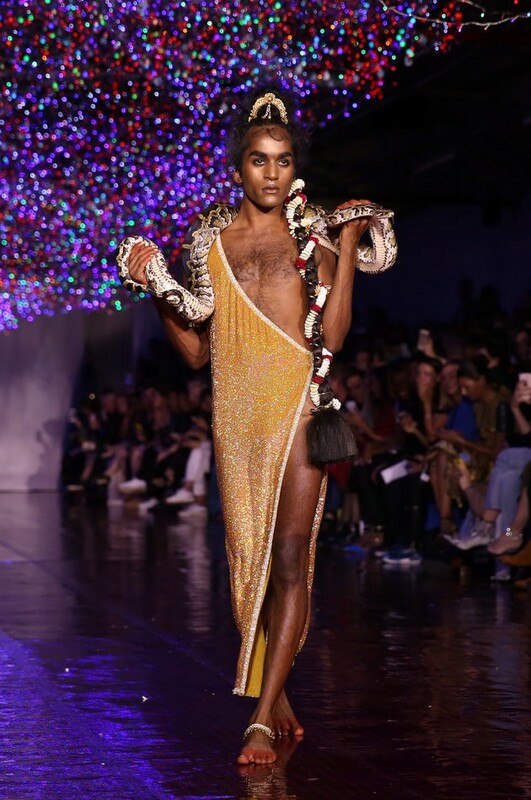 Which means the performer missed all the visual references that Ashish presented on the catwalk yesterday at London Fashion Week. 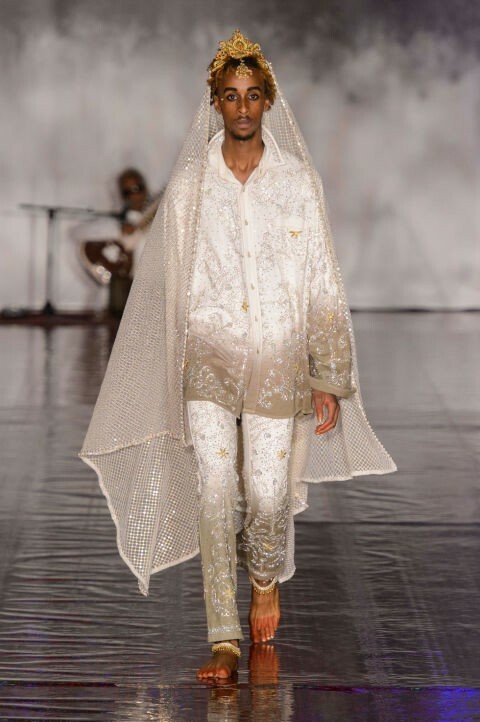 His SS17 collection featured a poignant, mythology-laden lineup of spectacular clothes not just for men and women, but also for everyone somewhere in between. The pacing of the show was slow, fluid, and lilting, eventually building to a furious crescendo. Models handed out long-stemmed red roses to the front row guests. The romance of the clothes was fully felt. The draping and the fabrics lent the collection an air of decadence and nostalgia that left us heartbroken. 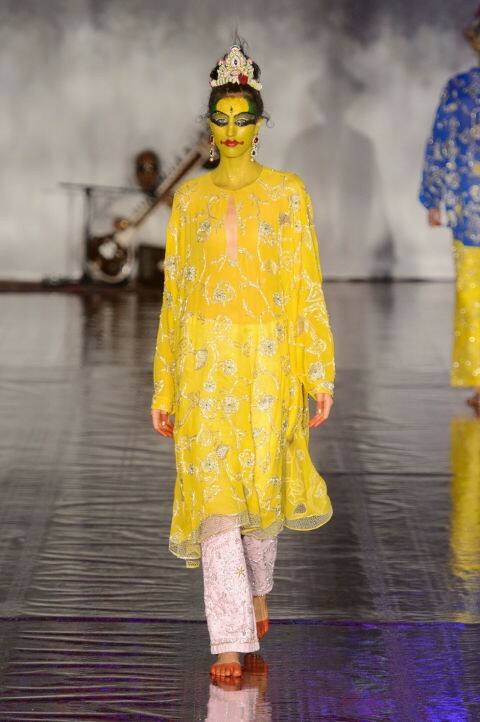 Ashish’s SS17 collection, titled “Bollywood Bloodbath,” featured an eccentrically styled mix of traditional South Asian garments and fabrics, but wrought into Western silhouettes. Streetwear in the form of tracksuits, jerseys, and denim, along with long, languid slip dresses and flowing white shirts — everything embroidered and adorned with sparkling embellishments and sequins — made this a memorable, and indeed fun-to-wear collection. …fashion has become — as if it hasn’t always been — more demonstratively, overtly political. 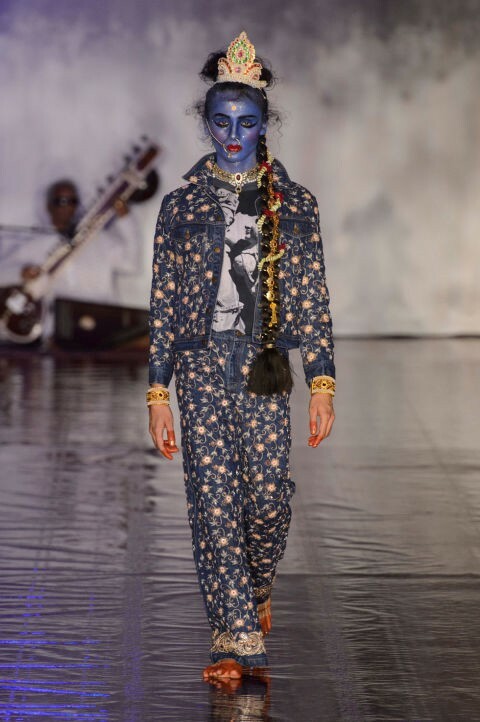 Gupta’s show cast a lineup of diverse models, included men and women of many races and ethnicities, as well as crossed boundaries of gender to encompass the range of human sexuality that many Hindu myths tell us the gods themselves enacted. In fact, the designer lifted every visual reference imaginable from Hindu mythology and modern culture. Headpieces conjured up the crowns worn by the Hindu pantheon. Crescent-shaped ornaments were set atop matted locks, reminiscent of Lord Shiva, and many models had their hair interwoven with garlands of pure white flowers. All the models in the show walked barefoot. Most sported payalia around their ankles and painted their toes with red alta dye. These semi-divine figures didn’t need shoes. They were both close to the earth, walking among mortals, and simultaneously lofty. Whether the clothes are appliquéd with words in sequins or with messages printed across their front or back, fashion has become — as if it hasn’t always been — more demonstratively, overtly political. No doubt clothes have always carried meaning coded within their shapes, colors, and uses. But today, the garment is a more blatant piece of political messaging than ever before. 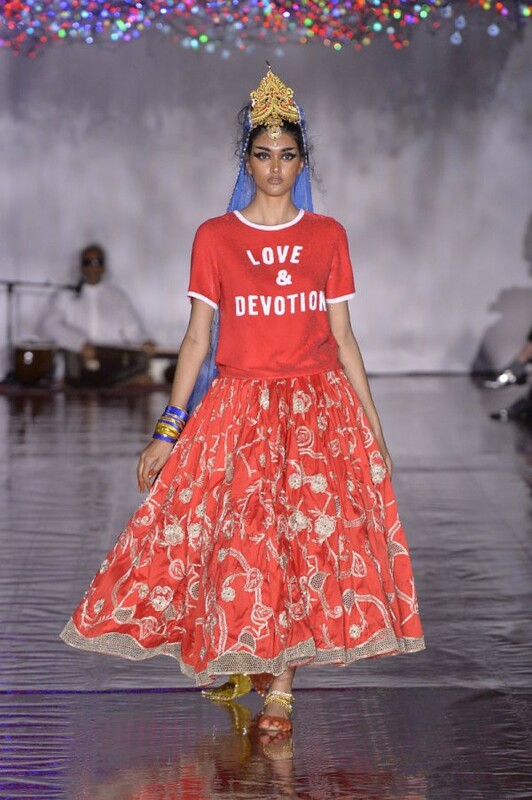 Ashish’s own use of phrases like “Love & Devotion” and “Your wish is my command” signal, through statements, sentiments. “Love & Devotion” are what we bestow to our gods on our altars and in our minds — even if it we don’t show it to our own people here on earth. 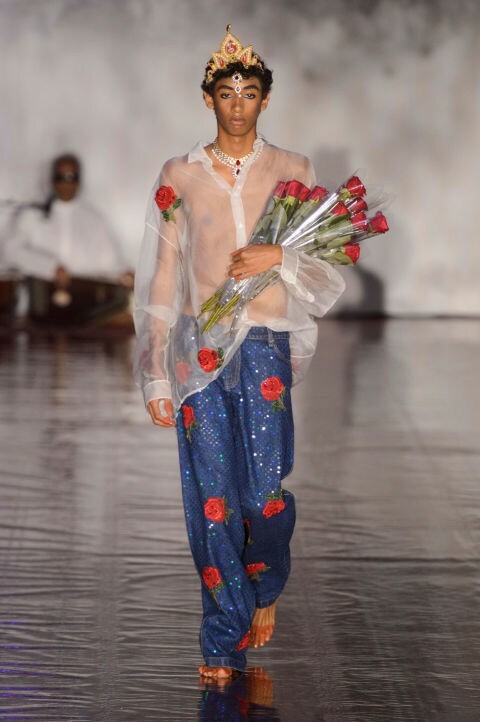 I hesitated, however, with the title of the designer’s show, “Bollywood Bloodbath.” I found less classic, pop, or even current Bollywood in Ashish’s work this season, even though it’s hard not to think of the film industry. I don’t want to feel lush or to “luxuriate” in the work he showed us. Instead, I was moved by what I interpreted as the designer’s complete refusal to play into a stereotypical understanding of Indian culture. 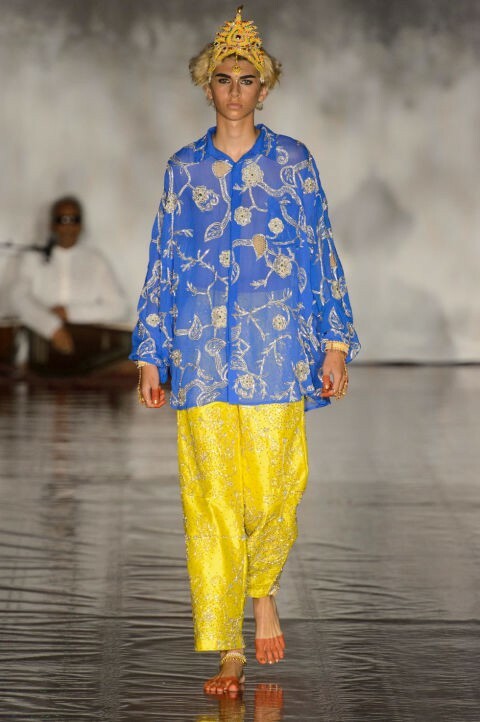 What I felt, more deeply, was the Ramayana written through clothes. If we want to understand how fashion traversed empires, continents, and histories, let’s look to the sage Valmiki’s epic narrative, the Ramayana. The story of Lord Rama’s banishment from his birthplace of Ayodha, his exile to the forest with his new wife Sita, her subsequent capture by Ravana to the island of Lanka, and Sita’s eventual test of faith to Rama while she was separate from him — these episodes together provide a rich text through which to examine our own current moment as South Asians in the UK and other parts of the Western world. 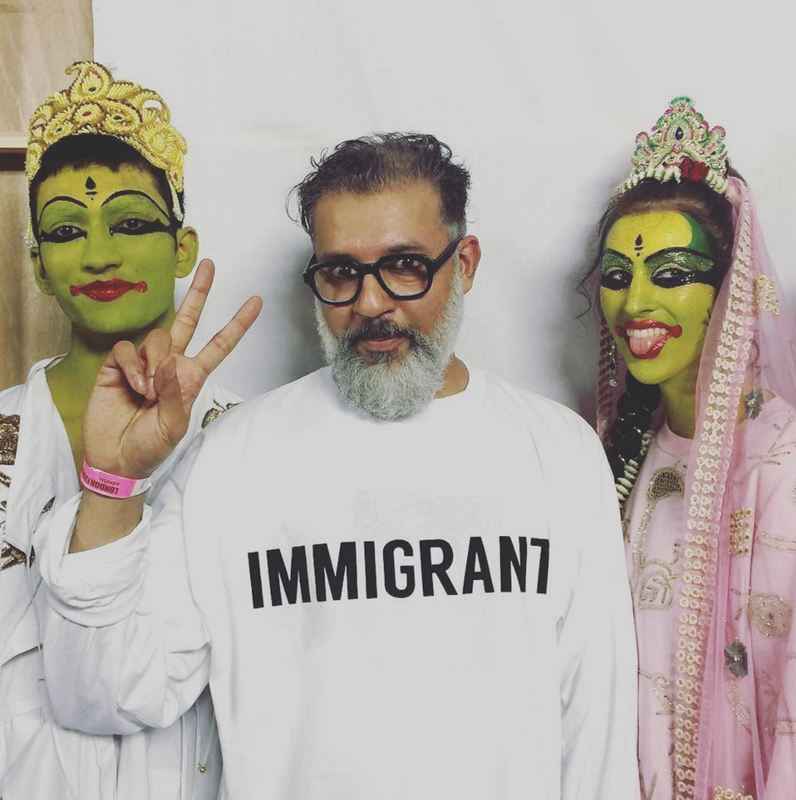 Backstage, the Delhi-born designer wore a t-shirt emblazoned with the word “Immigrant.” All the same, he’s been showing his eccentric collections at London Fashion Week since 2005. 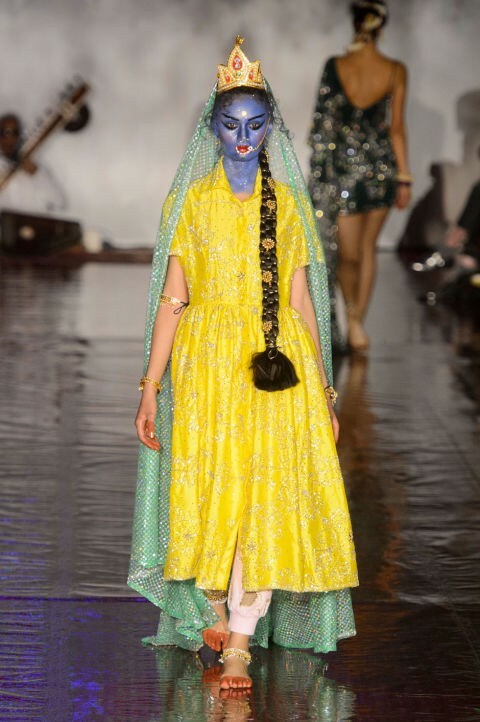 Some of the models’ faces were even painted the rich and iridescent blue of Krishna’s skin. His epithet, saanwariya, means “beloved,” since he was so fond of women, in particular, the maiden Radha. But his sobriquet derives, in fact, from the Hindi word saavla, meaning “dark-complexioned.” Children raised in the Hindu tradition have always wondered why Krishna’s skin is this strange shade. We comfort ourselves with the logic that he, a god, is special. Are we special for having dark skin, too, then? 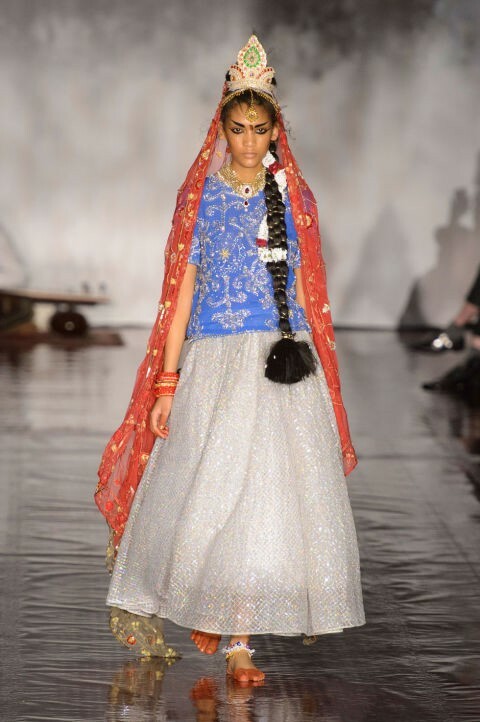 When we’re exiled to faraway homelands and when our cultures collide, Ashish gives us a spectacular and spiritual way to reimagine the possibilities — beyond Brexit and racism, beyond fear and ugliness.